VSD is written and published in French for the French audience. 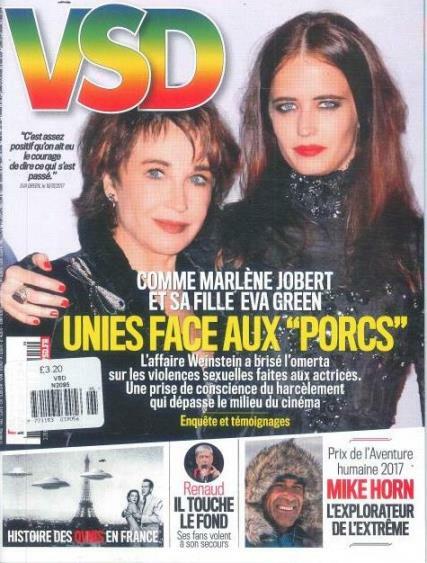 VSD is a leisure magazine that gives you weekly news, celebrity gossip, and information on places to go and things to see in France. With details about festivals, and special occasions as well as movies, music events and art exhibits. Locations and times are listed. You can find articles and news about food festivals, music groups and the best museums to see and what the featured exhibits are. Everything is for the French reader. You can also find paparazzi photographs, read about the places these celebrities visit and see what they are wearing. There are also general news articles and special event schedules. Read about developing stories in France and around the world. Most of the articles are simple written thumb nail snapshots of what is happening globally. Need something to do on the weekend? Read VSD Magazine to find out what is going on in Paris or the French countryside or maybe nearby Europe.